The Angry Smile comprehensively examines passive aggressive behavior in children, adolescents, and adults within families, school settings, the workplace, and online. 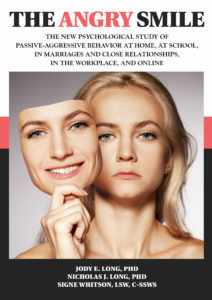 Benign Confrontation equips readers to unmask the hidden anger of a passive aggressive person, change the destructive nature of this behavioral pattern, strengthen the relationship, increase self-awareness, and affirm areas of competence. Click here to get your copy of The Angry Smile.